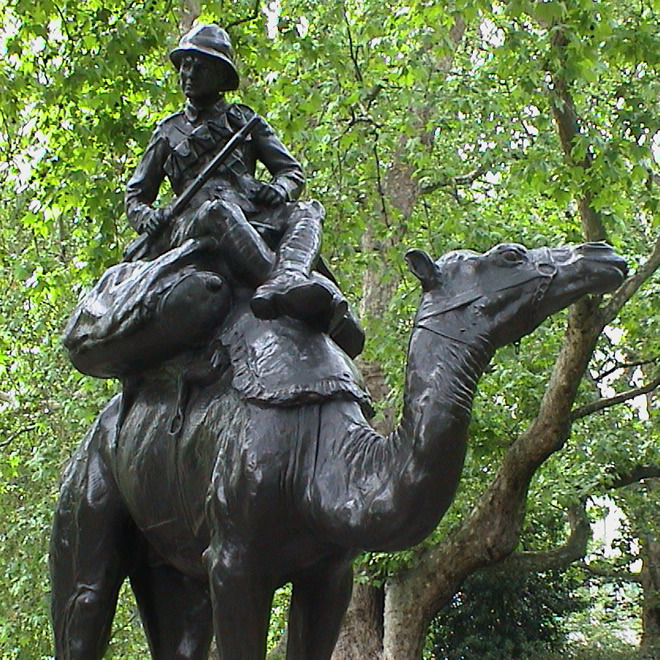 To the glorious and immortal memory of the officers, NCO‘s and men of the Imperial Camel Corps, British, Australian, New Zealand, Indian, who fell in action or died of wounds and disease in Egypt, Sinai and Palestine, 1916 -1917-1918. A bronze plaque on the east face lists those from the Australian Contingent who fell (191). One on the west face lists those from the British (106), the New Zealand (41) and the Indian (9) Contingents. The names are listed in their battalions, the officers first and then the lower ranks in alphabetical sequence. The sculptor was also a member of the corps. Unveiled by Chetwode. If you like photos of camels see the View from the Mirror's post on this statue.